This is blog post one out of four in the Fresh Relevance Travel Series. In today’s digital world, options available to consumers are increasing at such a rapid pace that it is becoming harder to confidently know where to look. Marketers are challenged with both attracting customers and then keeping their attention. This is especially true in the case of the fast-moving travel industry. An increasingly effective way to stand out from the competition, and increase viewer engagement, is through Website Personalization and customization. When customers receive personalized attention to detail, and customized offers based on their individual preferences, they are more likely to engage with your website - leaving your competition in their tailwind. The Fresh Relevance platform offers a variety of digital customization and personalization tools to help you successfully stand out as a travel brand that is engaged and ready to offer value and convenience to each customer. 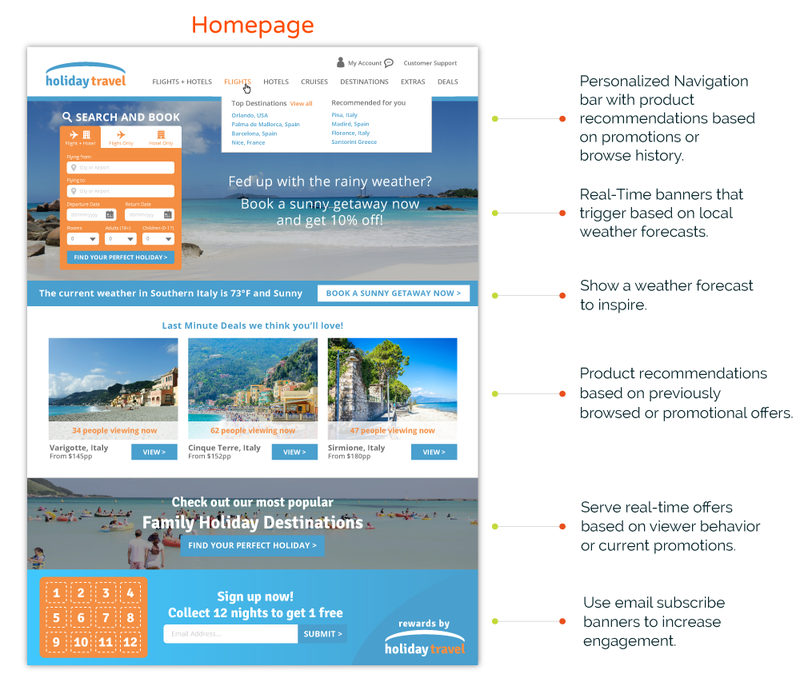 Here are a few ideas of how you can use Fresh Relevance features on your website. Your home page is the gateway to the world. This is your first chance to grab the visitor’s attention. With carefully optimized website personalization and customization, you can increase engagement and lead viewers along the customer journey. Decrease the time to conversion with Real-Time Tools and Personalization. Recommend products based on a viewer's search history or current promotions. Additionally, recommend popular offers from a frequently browsed category or behavior. 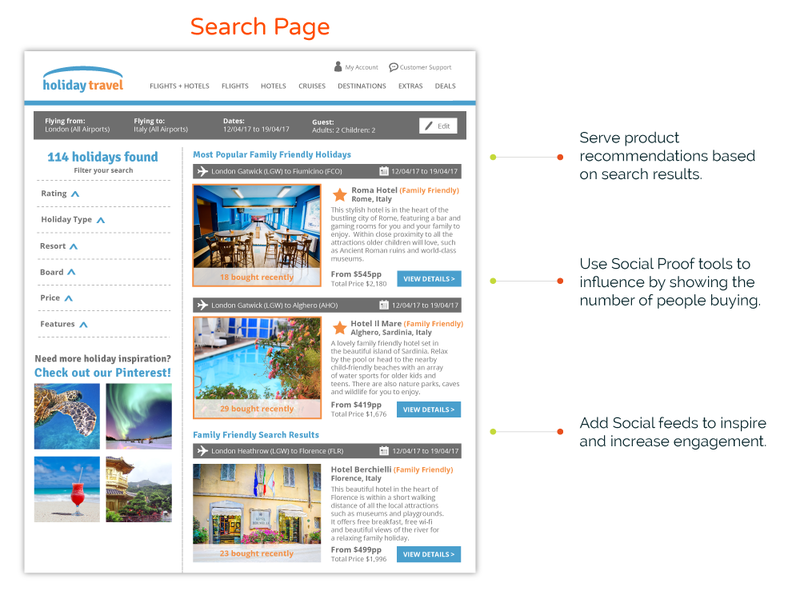 Use the power of Social Proof with tools that influence perception by showing the number of people looking or buying a vacation. The Product Page is the place where all the action is taken. Ensure that you don’t overload viewers with unnecessary information. 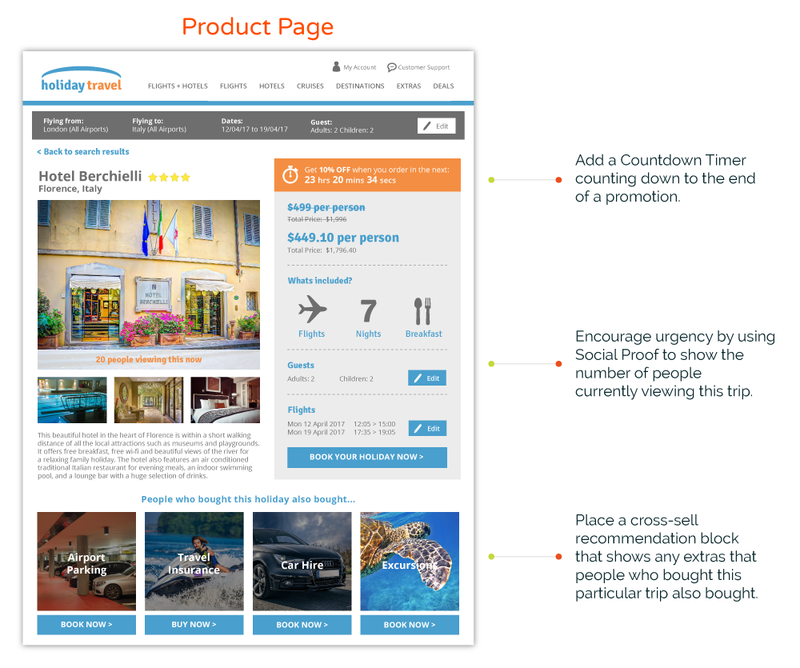 Encourage them to complete their purchase using Countdown Timers and Social Proof. 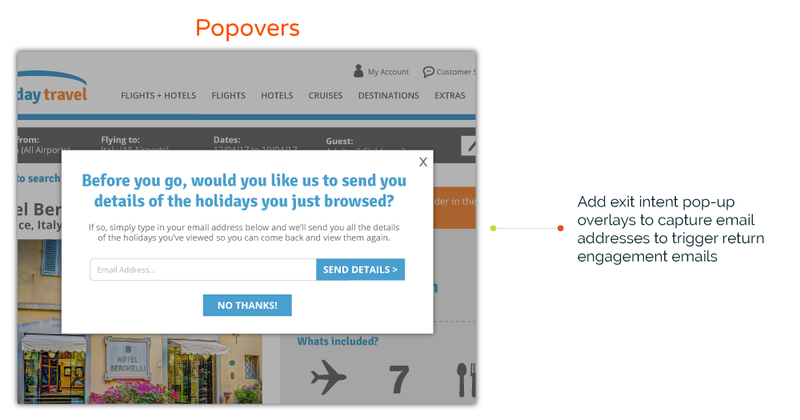 Popovers offer an enhanced opportunity to flag certain actions such as exit intent, welcome back messaging, and Coupons. In this example, Fresh Relevance is serving browse abandon exit intent popovers that signal Browse Abandon Email triggers. Additionally, you can offer coupons or promotional offers to bring the viewer back to the product page for purchase. The next blog article in this Travel series will be on real-time email triggers. Learn more about how your travel website data triggers and delivers personalised content using highly relevant emails such as Browse Abandon, Cart Abandon, and Post Purchase. All easily integrated with your existing email service provider.